With each step in the planting and harvesting process, farmers collect massive amounts of data that can provide individuals and companies with insights into what’s produced and how to make it better. However, farmers are frequently hampered in their efforts to curate their content, which can help drive crop-growing improvements, create new revenue streams through the ability to organize, visualize, and license up-to-date field data, and provide the agricultural industry with real-time insights. “Agriculture is one of the largest and most important markets in the world with one of the least amounts of digitalization,” says Jason Tatge, chief executive officer at Farmobile, an opinion supported by the McKinsey Global Institute’s Digitization Index, which shows that agriculture is the least digitized of all major industries. The agriculture industry has widely adopted precision technologies to drive farming efficiencies and outcomes. But data generated from machines has not been consistently collected and stored in order to help drive improvements for farmers and the agriculture industry. Technologies such as IoT, cellular connectivity, and cloud computing help generate large amounts of precise data, but there are gaps in connectivity to data repositories with data standardization. Farmobile aims to change the industry’s approach to, and interaction with, data by making it one of a farmer’s most valuable commodities. Consequential decisions must be made when growing a crop, such as: What type of crop are you going to plant? How many seeds per acre should be planted? What type of applications are being used to prevent yield loss or promote yield growth? The outcomes stemming from these decisions as well as events outside a farmer’s control, such as weather, directly affect a crop’s success. Farmobile believes that helping farmers and other stakeholders in the agriculture industry to visualize and use real-time farming data can drive better “in season” decision-making. Farmobile’s hardware is an in-cab IoT device called a passive uplink connection (PUC) that’s installed on farm machinery that automatically collects machine and agronomic data every second. Data is securely transferred to Farmobile’s data repository and standardized into Electronic Field Records (EFRs), capturing individual data layers field-by-field. Farmers can view the data they’ve collected via smart device, computer, or laptop with the Farmobile DataEngine User Interface (UI) and App. Farmobile seeks to help farmers not only use data collected by its PUCs as a learning tool, but also an additional source of revenue. So the company created the Farmobile DataStore as a revenue sharing model to provide farmers an opportunity to sell single-use licenses of data to interested buyers. After evaluating its business model and long-term growth goals, Farmobile transitioned its infrastructure to AWS for speed and efficiency. It uses Intel’s Hyperledger Sawtooth distributed ledger for the Farmobile DataStore to give farmers transparency and control over their data transactions with approved buyers. Blockchain tracks the actual transaction, including account set up, creation, confirmation, execution of the offer, and delivery of the digital asset. Farmobile took a three-phase migration approach on AWS, starting with a proof of concept (PoC) that lasted three months. “We took a step back and said, ‘What are the foundational technologies and services within AWS we want to build on to deliver an optimized, scalable, secure, and reliable solution for the agriculture industry?,’” says Schibi. The team decided to migrate its existing system as-is to AWS to ensure it could handle volume projections for harvest in 2017, while simultaneously designing its new Farmobile DataEngine platform and blockchain solution to run on AWS. Farmobile uses multiple AWS services to run its application, including AWS IoT and Kinesis Streams to collect and process data collected from PUCs. The new system is built for speed, efficiency, and scalability, and can handle tens of thousands of concurrent PUC devices in use during peak periods of seasonality. The Farmobile DataStore, hosted on AWS and using Intel Hyperledger Sawtooth, provides both farmers and third-party buyers a simple and secure way to conduct data transactions. The company is a heavy user of Amazon Elastic Container Service (Amazon ECS) and Docker containers, Amazon Simple Storage Service (Amazon S3), Amazon DynamoDB, Amazon Elastic MapReduce (Amazon EMR), Amazon Elastic File Service (Amazon EFS), and Amazon Aurora. By running the Farmobile DataStore on AWS with elements of Intel’s Hyperledger Sawtooth distributed ledger platform, farmers can seamlessly sell single-use licenses of their farm data to buyers while keeping the farmer’s identity completely anonymous in the process. Farmers have full visibility into the identities of potential third-party data buyers, such as agronomists, equipment producers, and ag retailers, and can decline an offer to anyone. “We’re building trust and helping farmers monetize their data in a way in which they’re comfortable,” says Tatge. For Farmobile, the launch of its new exchange based on blockchain is only the beginning. “It’s foundational technology that will continue to grow in adoption and allow us to gain more trust within the entire industry,” says Tatge. Next steps for the team include migrating more of its infrastructure to a microservices-based model on AWS and expanding its global reach. Farmobile is an AWS Partner Network Technology Partner and independent data company focused on creating foundational technology for of the agriculture industry. The company’s technology collects second-by-second data points from a wide range of agricultural machinery and systems, then turns them into Electronic Field Records (EFRs) that make it easy to gain insights, share with advisors, and power decision-making on the farm. 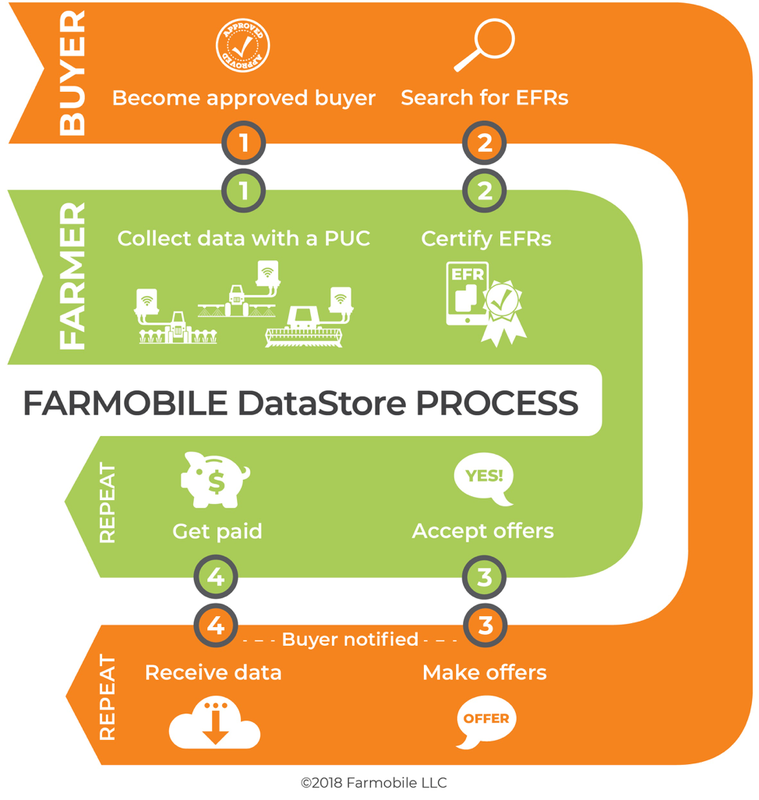 The Farmobile DataStore is the first digital exchange to connect farmers with data buyers. Read about the newly-launched Farmobile DataStore here and read about Farmobile on the company’s website here.